Globalization vs. regionalization, Environmental focus, Energy Challenges, E-Commerce, trading, mergers & acquisitions… The Industrial world is deeply changing and so is the Chemical Industry: 20 years ago, we used to say that « Companies change, but Products & Assets remain » now we could say « Companies, People, Assets, and even the Products change »: Differentiation is still one of the most important concepts today to stay on the Global battlefield. 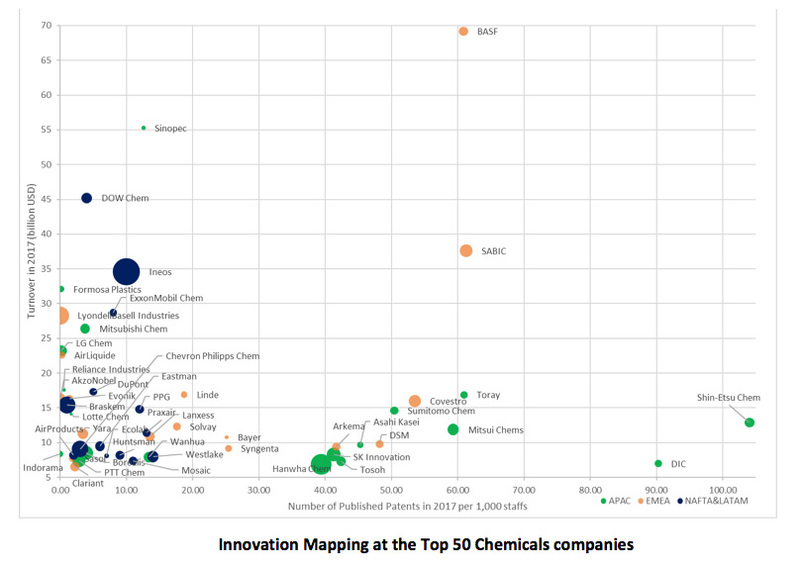 The graph above illustrates the number of published patents in 2017 per 1,000 employees vs. the 2017 turnover for the top-50 chemicals companies. The bubble size reflects the turnover of each company by 1,000 employees. And gain new customers, markets…. 3. How to handle this speed-up to stay in the race? Tools catching multiple data sources for analyzing, weighting, summarizing and simulating them in order to plan and quickly make secured decisions: Tools integrating these new realities (« Always more criteria, more raw data», « Reactivity of the push / pull innovation cycle”, “Introduction on the market is clearly becoming a differentiation-criteria »). Tools customizing, populating with company data – external data, and taking into consideration the speeding-up of the Industry changes (products, markets, clients, organization…). We have BtoB Marketing Strategy and NBD day to day business experience, it is our DNA since 2000 and near 400 projects. For example, A³ has been made to improve – using existing sales data – Opportunities Pipeline, Sales pricing & margin…. 6. Why you will use A³? For Pricing & Pipeline. Are the opportunities we are pursuing in the right markets? Are they accessible and attractive for us? How should we rank one over another? What priorities and sales effort should we allocate…? Is our pricing with all subsidiaries of our Key Account customers consistent? On what clients should we focus our commercial and technical support efforts today and tomorrow as well as the next quarter or year …? How to increase our Pipeline Win ratio? What additional sales revenue can we generate? What margin can we make? Or for this product/product line? In conclusion, having operational data is not enough anymore! … And most importantly, to position your business in a continuous, fast, repeatable and efficient process. Follow us to get technical details on A³ … Our next Newsletter will be all about A³, how it works, the Analytical Tool part vs. the Simulation parts for forecast… Coming up soon! Stay tune!